WAFFLES: I've got to shiny up my handsomeness for the ladies, on account of it's Mancat Monday and all. WAFFLES: The ladies need them some handsome on Mondays too, you know. 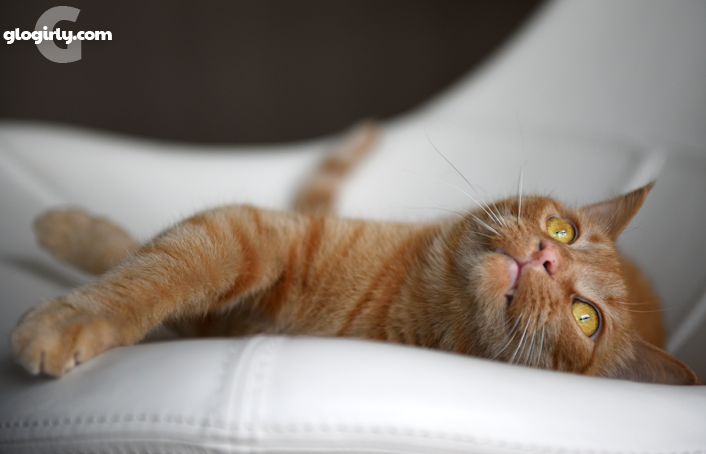 WAFFLES: I can do Thursday and Friday too. Works for me. 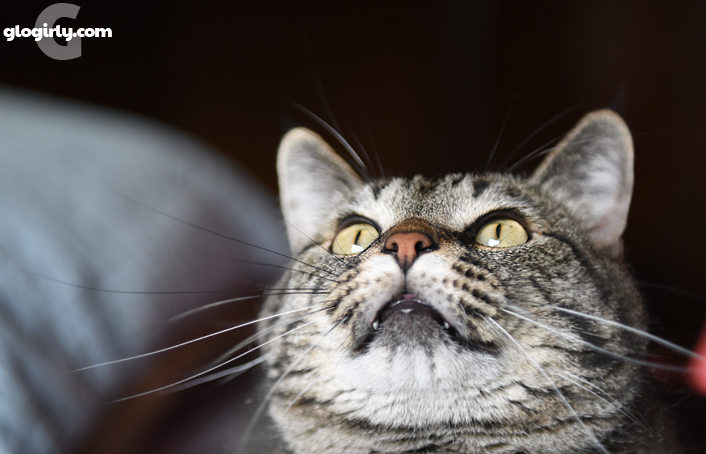 Some of Waffles' most expressive photos happen when we're not even trying. 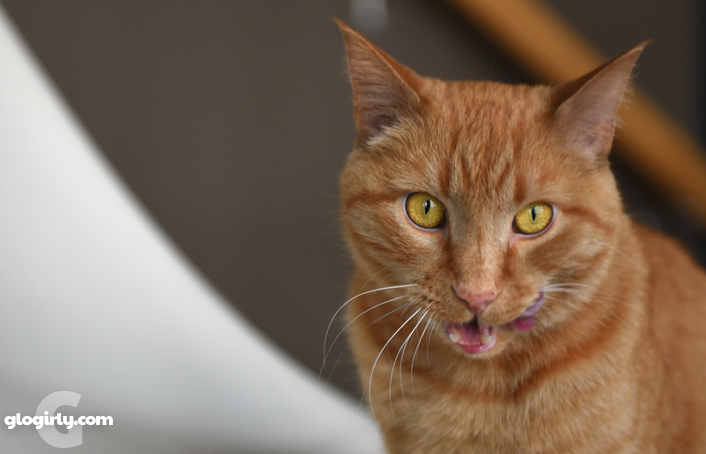 Earlier this year we were taking pictures for a product review when Waffles decided he was done with the food and the taste testing (really???) 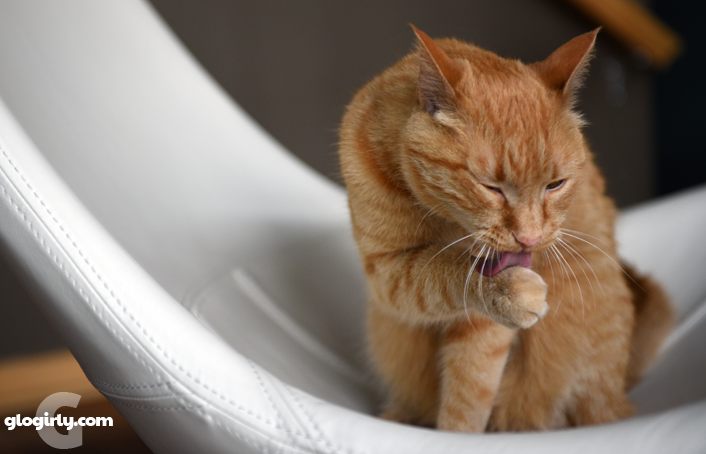 and opted for a quick bath in the white swivel chair. First comes the preening, then comes the posing. Good thing Glogirly still had her camera ready. Katie is never far away though. 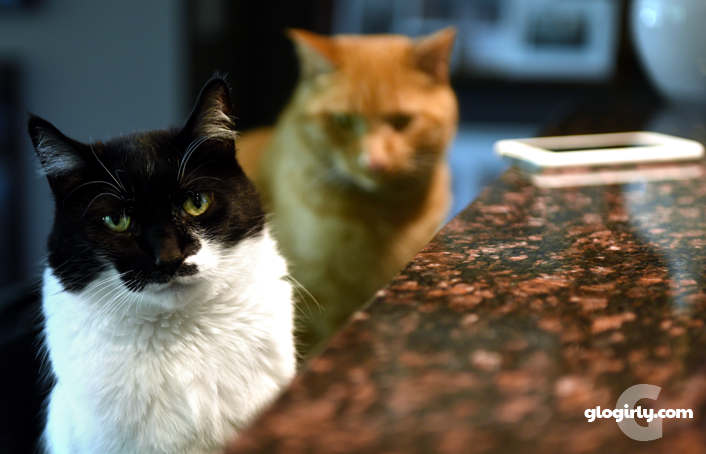 She'll often maintain a safe distance, watching every move he makes. Usually with that "I can't believe my eyes" look on her face. WAFFLES: Hey Boss, you come here often? KATIE: Seriously? You're going to use that line on me? 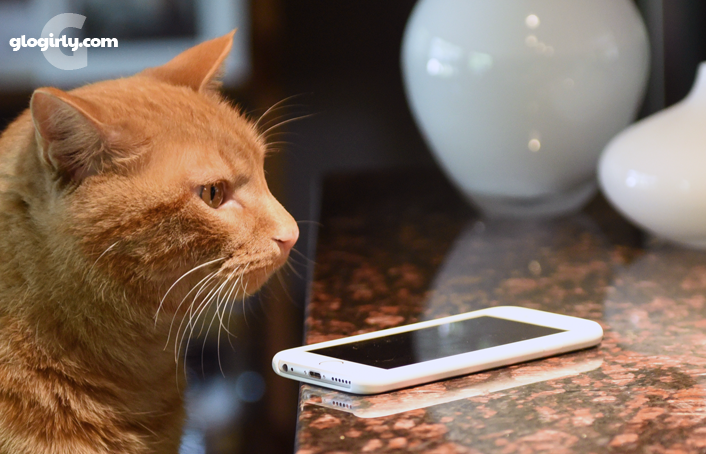 WAFFLES: Ok. How about this - can I get your digits so we can FaceTime? 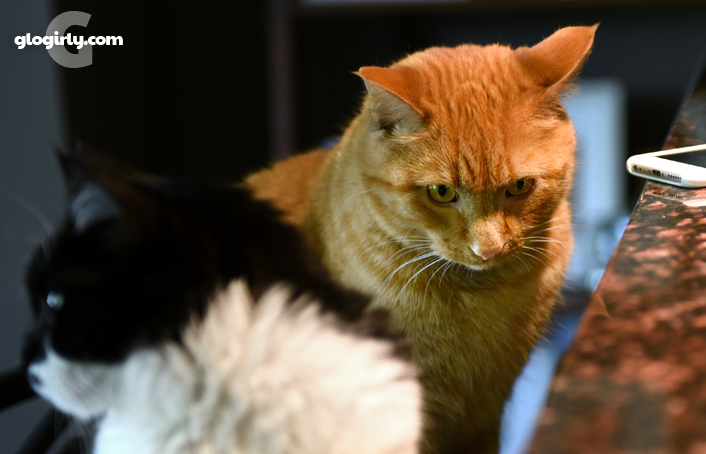 KATIE: Waffles, you're already in my face ALL the time. The last thing I need to do is FaceTime you. And mitts off my digits. WAFFLES: Man, picking up chicks is hard. KATIE: Waffles, you've got a lot to learn about girl cats. 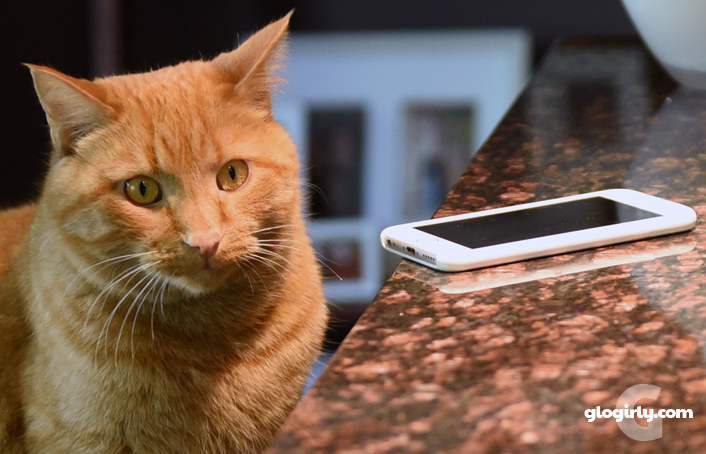 WAFFLES: So what am I supposed to say? WAFFLES: Ok. I like your fur. KATIE: Waffles, you need to romance it. "I love your furs... how do you keep them so silky-soft?" WAFFLES: Thanks, Boss. I lick them everyday. KATIE: No Waffles, you're supposed to ask ME how I keep MY fur so soft. 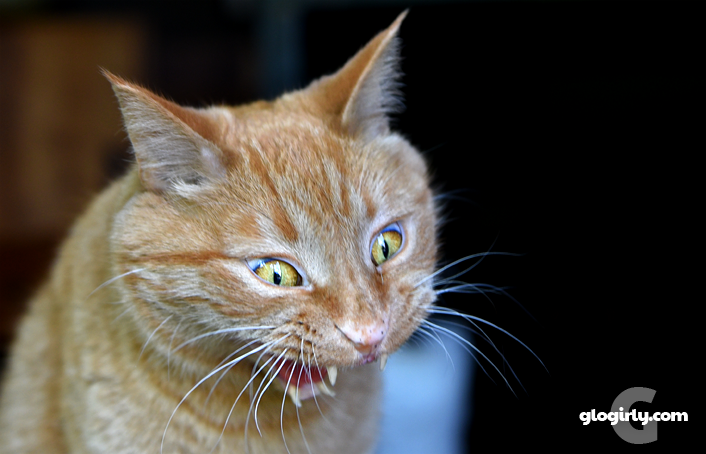 KATIE: Waffles... if you want to impress the ladies, do NOT bring up hairballs. Ok, let's try this again. Just say, "Hello, my name is Waffles. What's your name?" WAFFLES: Got it. HELLO, MY NAME IS WAFFLES! KATIE: Take it down a notch, Waffles. A little lower. Glogirly has taken pictures of Waffles at the kitchen counter before. She's taken pictures of Katie at the kitchen counter too. 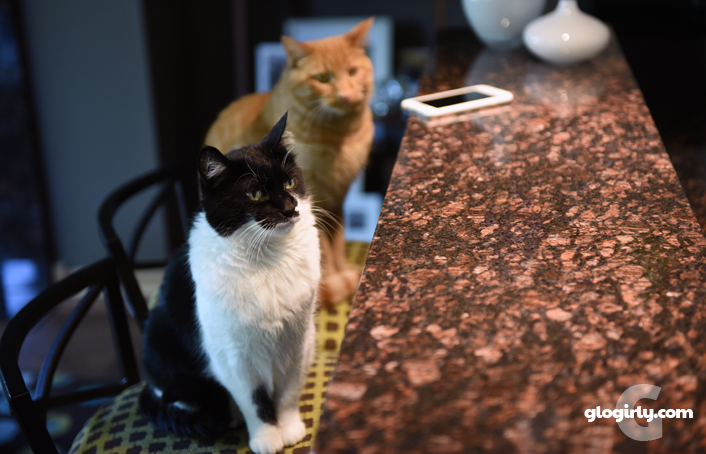 But getting BOTH Katie and Waffles at the kitchen counter together is a rarity. It was about 4:45pm. Katie and Waffles were getting ready to get ready for dinner. Glogirly was emptying the dishwasher when she looked up and saw what you see in that first photo. She's learned to always keep her camera close so she grabbed it and started shooting. There was plenty of grumbling about the light too. Something about bright daylight from the windows behind and harsh light above from the kitchen pendants. Katie and Waffles didn't care. They didn't even care that they were sitting just inches apart. All they cared about was that it was now 4:59pm and dinner was about to be late. 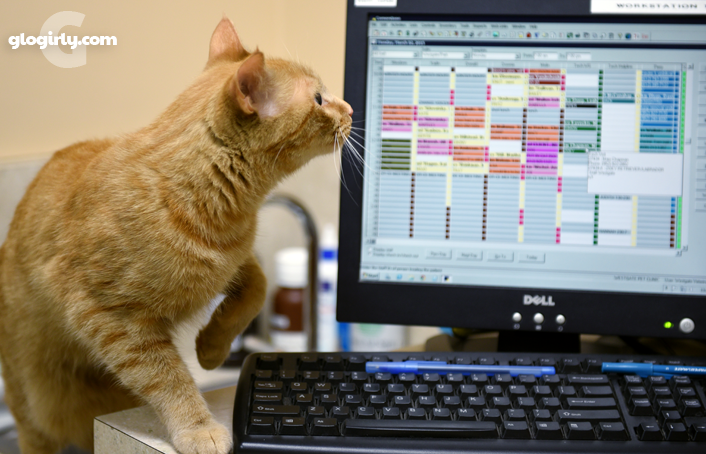 WAFFLES: Hey Boss, it's Take Your Cat to the Vet Day. We should go! WAFFLES: Why not? It'll be fun! KATIE: Waffles, we were just there. Let's not wear out our welcome. WAFFLES: But it's Take Your Cat to the Vet Day, Boss. 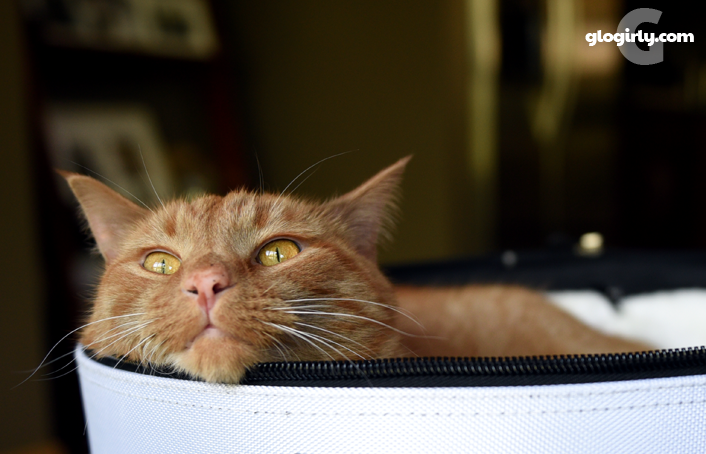 We have to go! KATIE: Waffles, what matters is that we remind everyone how important it is to see their vet regularly. WAFFLES: Why? Is it so the vets don't get lonely and stuff and miss us? KATIE: Waffles, you do know that Dr. Karlin's world doesn't revolve around you, right? WAFFLES: Yeah, but every time I see her she makes me feel like it does. Don't let your vet miss you. Schedule a wellness check today. It's true. We love our vets. In fact at one point, Waffles wanted to marry Dr. Karlin. 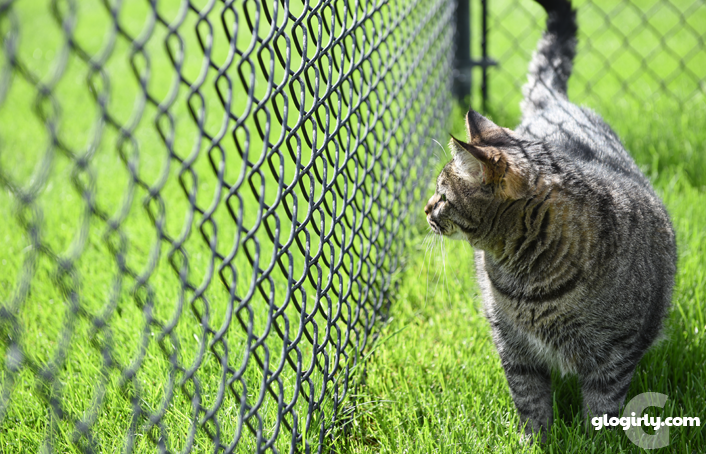 His hopes were dashed though when he realized that not only was she taken, she was seeing untold numbers of other cats. But that hasn't stopped him from flirting. Or amassing more vet tech girlfriends than he can count. 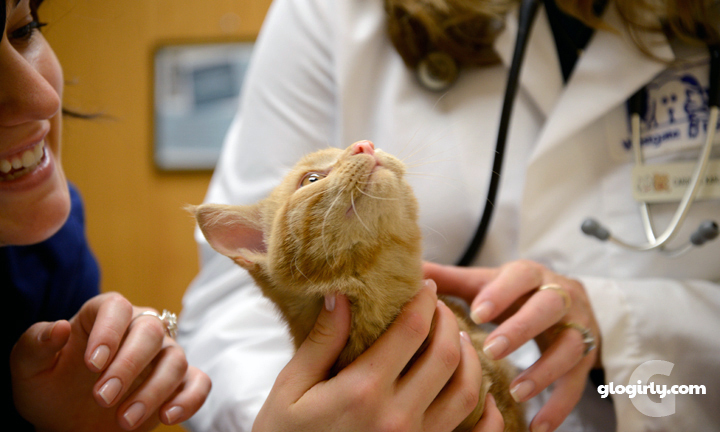 In all seriousness though, we're very passionate about the importance of regular veterinary visits. Living healthy, happy and long lives with our forever families is what it's all about. 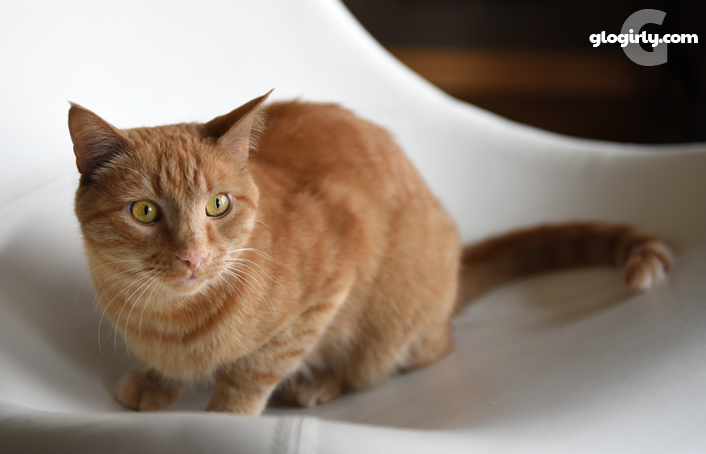 Waffles is four years old, generally very healthy and he sees the vet once a year. 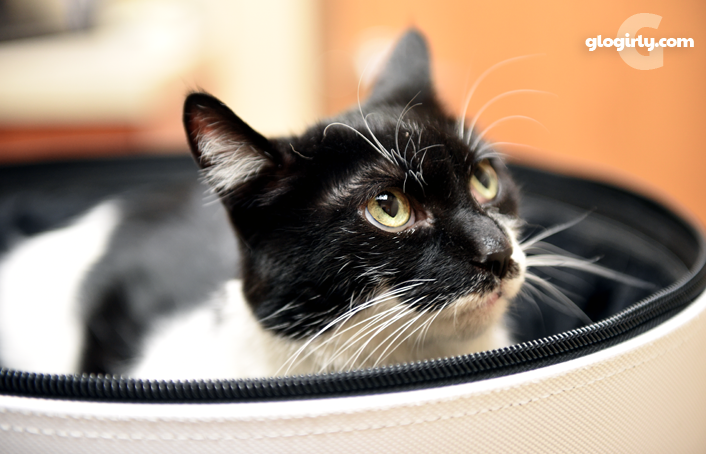 Katie is approaching 12 years old and is now considered a senior cat so she see's the vet twice each year for her wellness visits. 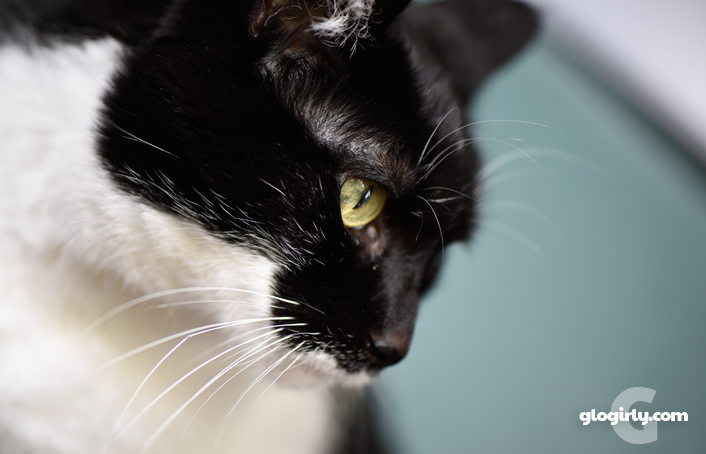 We recently visited a new holistic vet who we absolutely adore. (Ok, it's probably Glogirly who's doing most of the adoring.) 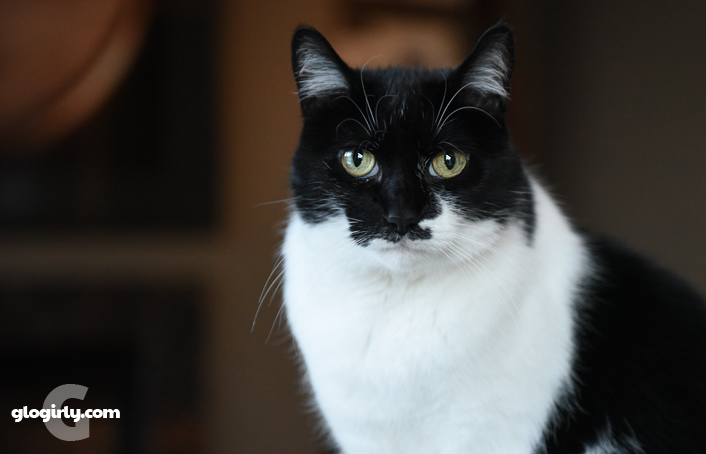 Katie was recently diagnosed with early stage kidney disease. It's this that prompted Glogirly to seek help from a vet trained in both traditional western medicine as well as eastern "holistic" medicine. 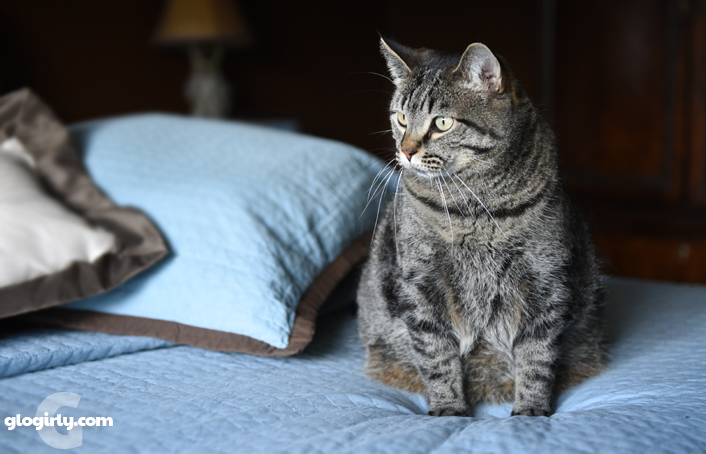 Dr. Sue from the Cat Care Clinic in Mahtomedi, MN has been extremely helpful in guiding us on nutrition and in particular has already made a big difference in Katie's health and treatment plan. 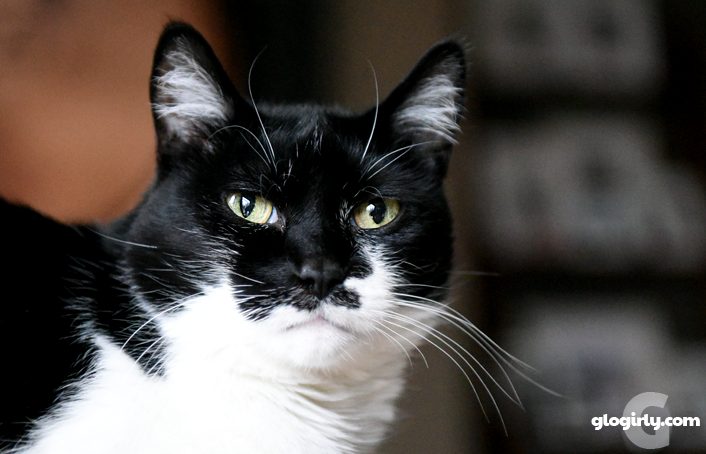 Katie is doing great... please don't worry a whisker about her. 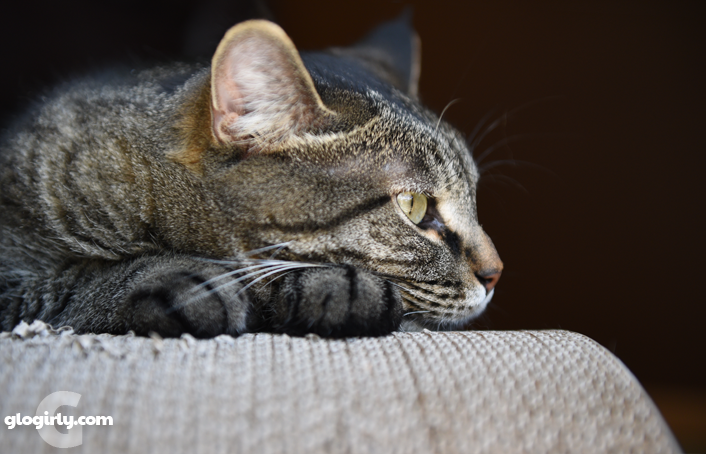 As we understand it, nearly 30% of all cats will develop kidney disease at some point in their lives. 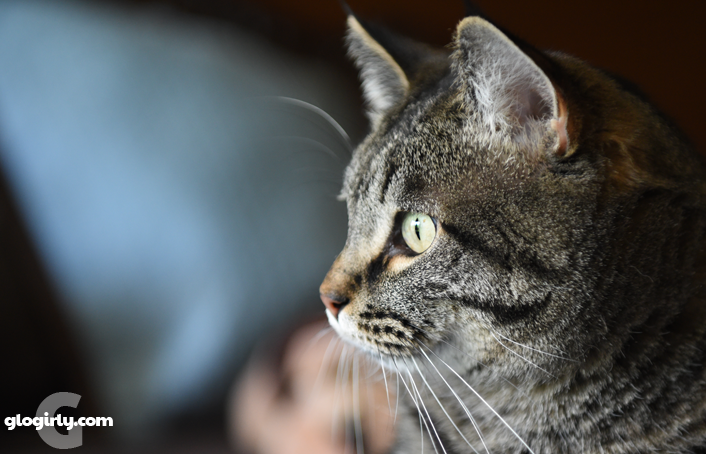 There is no cure, but with appropriate treatment and nutrition, many cats are able to live long, healthy, happy and even symptom-free lives. We're very excited to share much more with you about our holistic consultation and visit in a future blog post. Do you love your vet? 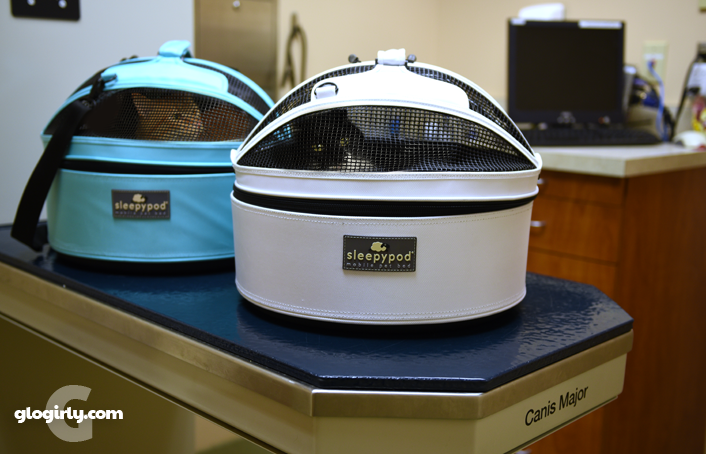 If you're not happy with your vet, maybe it's time to shop around. We have a feeling there are lots of Dr. Karlin's and Dr. Sue's out there. It just might take a little looking. 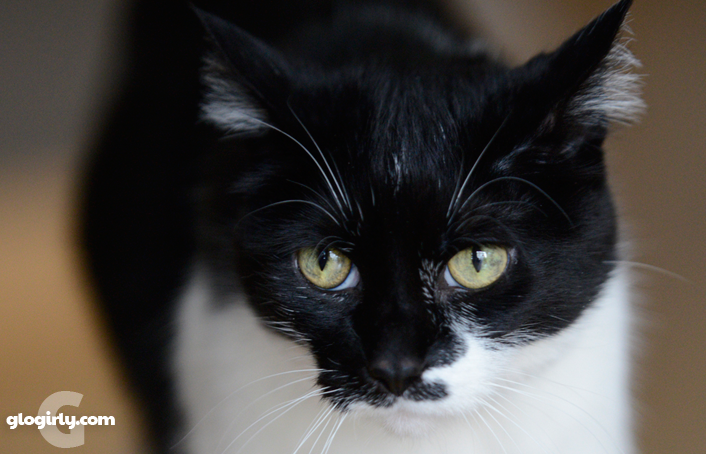 KATIE: Today we're turning over the blog to Glogirly so she can tell you all about the Amazing Acro Cats. Meanwhile, Waffles and I will be practicing our own act on Gloman's guitar and Glogirly's piano. KATIE: Yeah... don't quit your day job, Waffles. When I discovered the Acro-Cats were making a stop in Minneapolis on their 2016 tour, I could hardly contain my excitement. 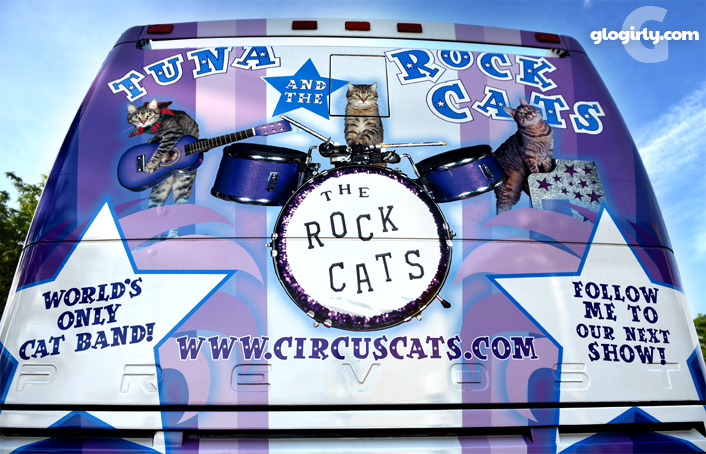 Cats performing circus tricks and playing in a rock band, just a few miles from the Townhouse??? Sign me up! 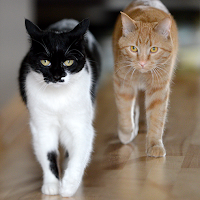 Much to Katie & Waffles' chagrin, I invited our cat sitters out for an evening of feline fun and tricks. You know those rare experiences in life that leave your cheeks sore from laughing and smiling so much? That's exactly what seeing the Acro-Cats was like. 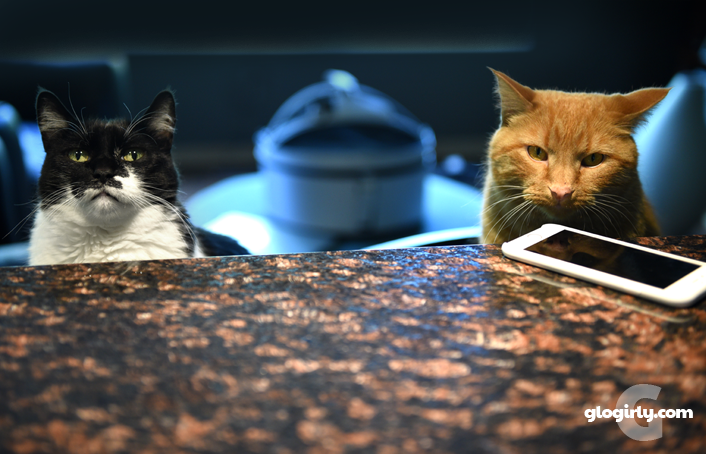 The show is a blend of engaging tricks that show off each cat's unique abilities, lots of fun and humor between the cats and their three human assistants and even some how-to tips on training your own cats. 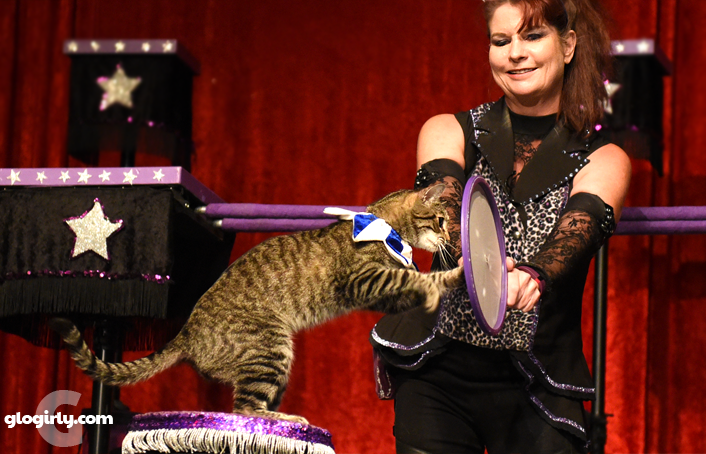 Samantha Martin is the cat lady behind this amazing feline troupe. From the moment she steps on stage, it's clear she has a very unique bond with these beautiful animals. 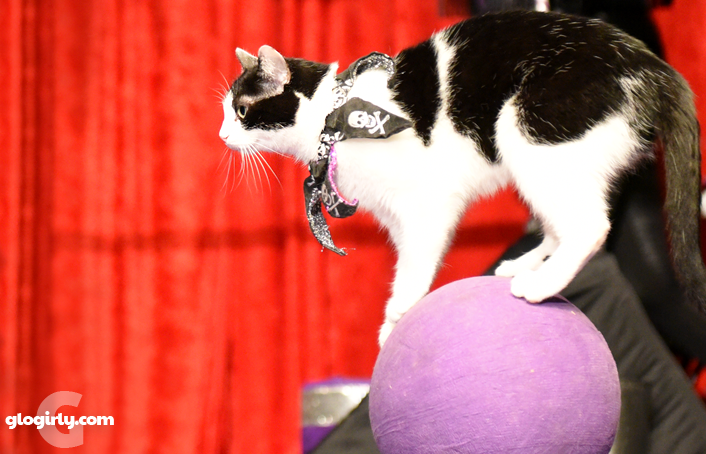 On her cue, the Acro-Cats perform tricks like jumping through hoops, riding a skateboard, balancing and walking on balls and leaping high, high through the air. 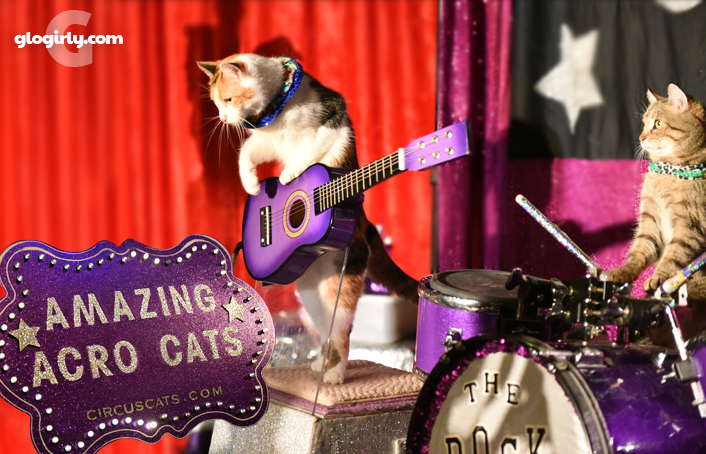 And if that isn't enough fun, band leader Tuna and the Rock Cats play just about every musical instrument you could imagine. And a few you haven't! 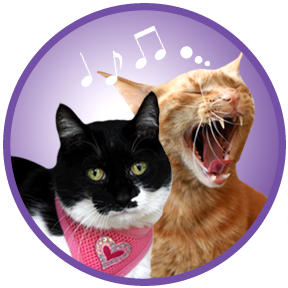 The Amazing Acro-Cats and their human staff are devoted to promoting cat-training awareness and supporting feline adoption and rescue across the country. 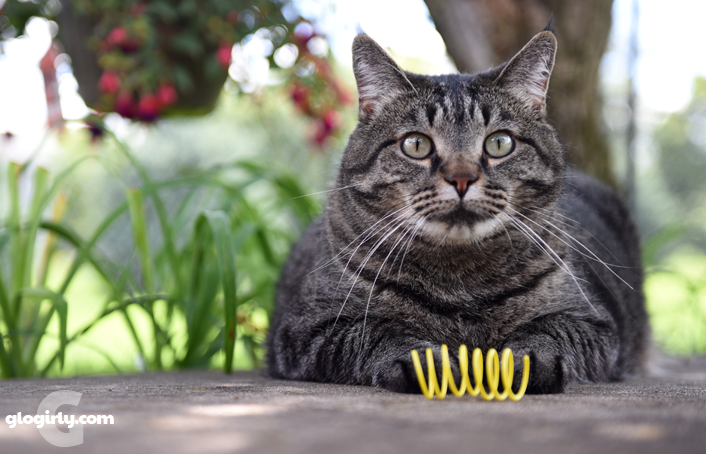 Their mission is to show cat lovers how they can improve their relationships with their furry family members through positive reinforcements that result in long-lasting and beneficial behaviors. 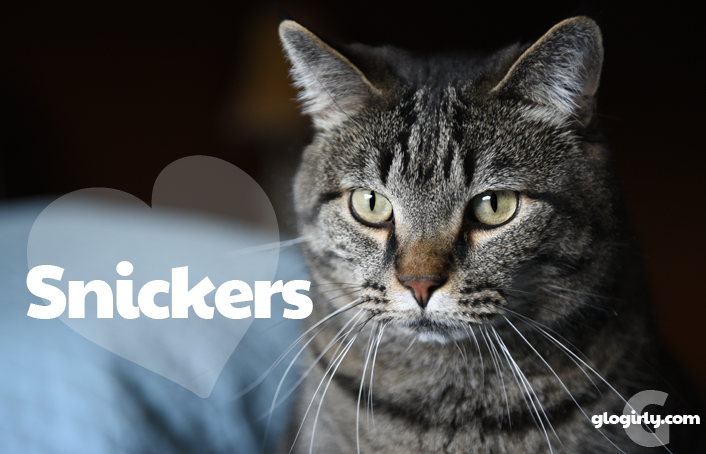 It's about strengthening the human-cat bond. In fact, some of these 'tricks' can save a life. 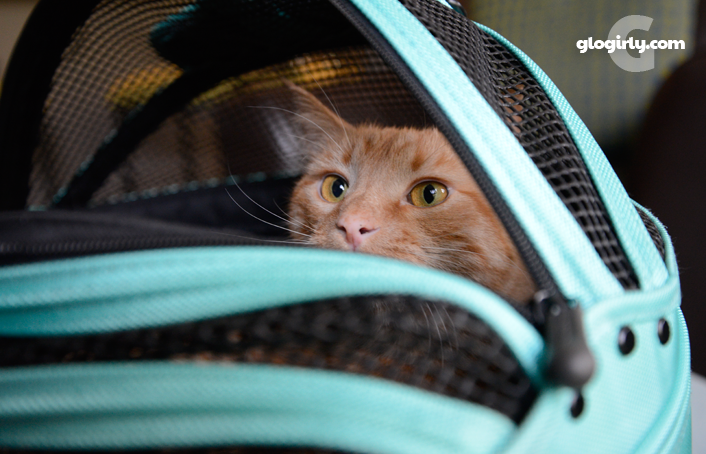 When they hear a certain cue, each of the Acro-Cats are trained to go inside their carriers (which are all on stage during the performance). Just imagine how important that can be in the case of an emergency at home. 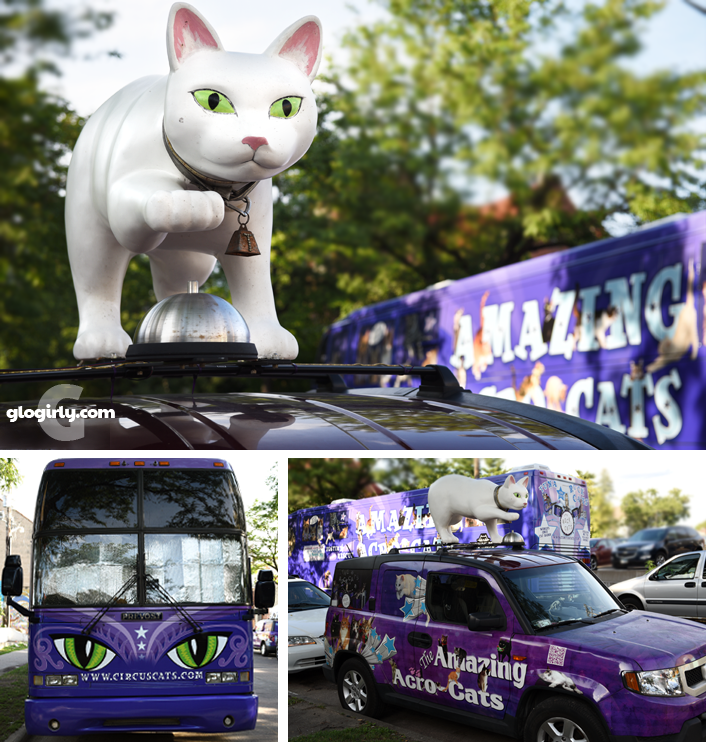 Another aspect of their mission is forming partnerships that involve fostering and finding homes for cats and kittens as their troupe of former orphans and strays travel from city to city in their custom cat bus. 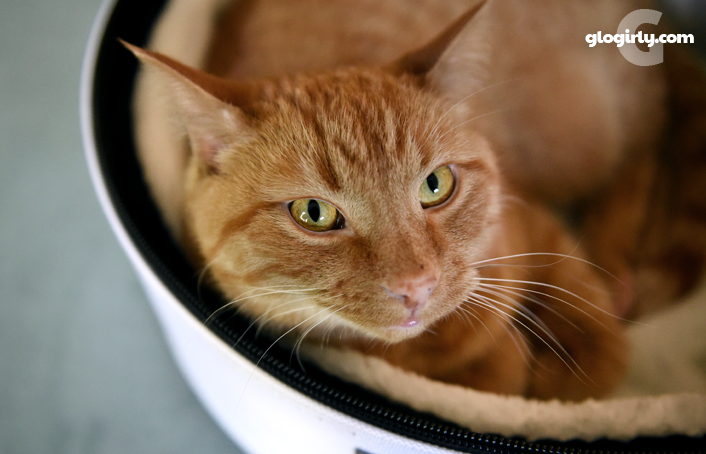 Every one of the cats is a rescue and during a very special part of the show, Samantha shares the back story of each cat. The Acro-Cats know how to roll! Their new touring bus, which was funded in part through a recent Kickstarter campaign, is nothing short of amazing. And check out the Tuna Mobile, complete with Tuna and her signature bell on the roof! 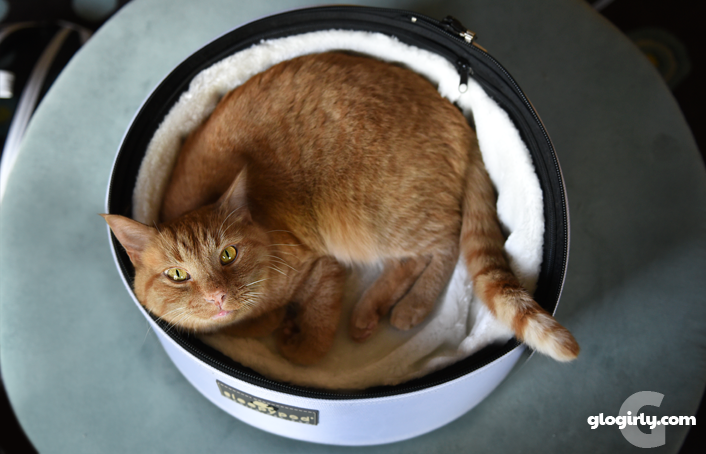 Beautiful all-white Tuna is the band leader and brand ambassador. She loves to ring her bell and push the lever on the light-up applause sign. She also plays a mean cowbell in the band. I couldn't help but be reminded of Katie and her 'bossy' personality when Tuna would come out on stage. Perhaps I need to find Katie her own light up applause sign. Pudge is a beautiful long haired grey kitty who was found abandoned in a box on the side of a road. Now she's a happy, champion hoop jumper. Seeing the connection between Pudge and Samantha is so inspiring. You can just tell how much they trust and love each other. 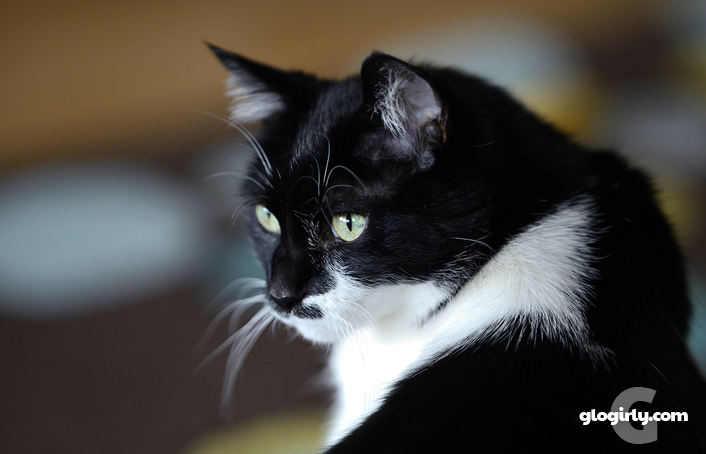 Gorgeous tuxedo Jax was found in a cooler outside a truck stop with her two brothers. She's fearless. Except when it comes to Cluck Norris, the chicken (yes, chicken!) who's also part of the talented troupe. Jax's specialty is walking on the ball and balancing on top of a skull while catching treats in her mouth. Alley was found in, you guessed it.... an Alley, along with her two brothers. Now she amazes her fans by leaping high in the air from platform to platform. She's even landed a spot in the Guinness Book of World Records for the longest cat leap! That's Buggles in the background looking on. He kicked off the show by riding his skateboard and then sat on top of that tall platform just watching all the action for the rest of the show. 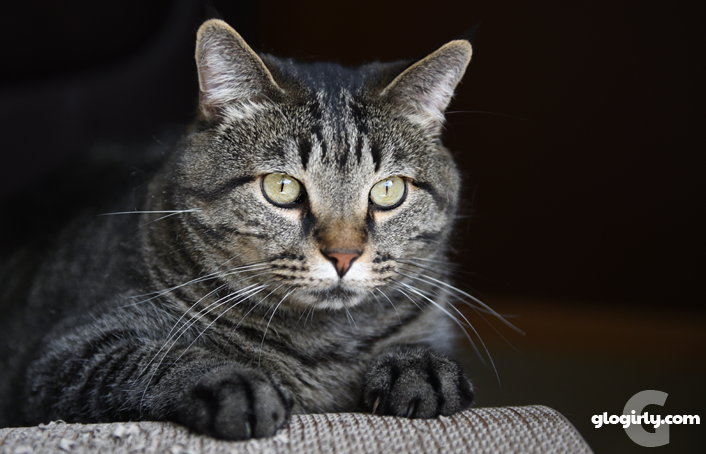 Wiki was rescued along with his brother Frisco from a high volume kill shelter when they came to Samantha as foster kittens. Frisco was adopted right away. 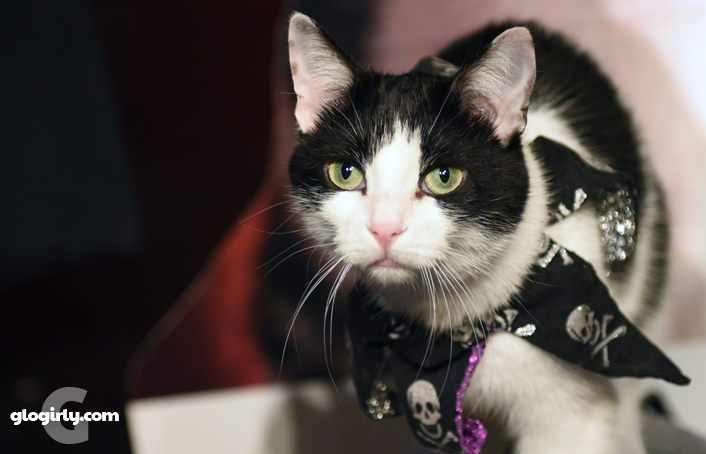 Wiki showed a love for performing and was adopted later at about 8 months, but was returned when he apparently made it clear to his new owner that he did not want to be a single, unemployed cat. 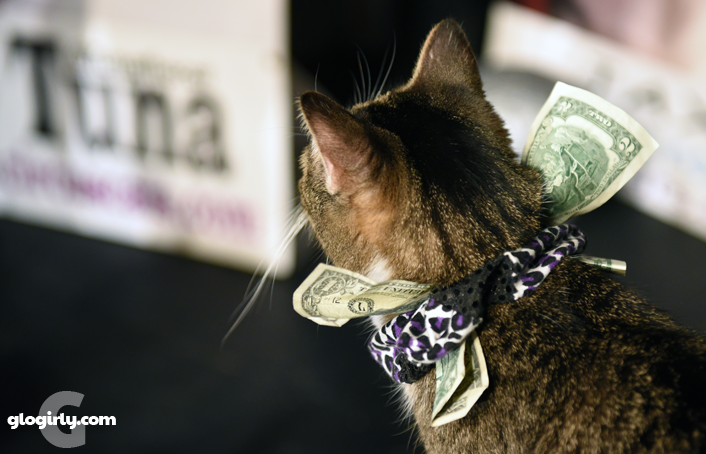 Wiki likes to wander offstage during the performance and mingle with the crowd while his adoring fans slip dollar bills under his collar. In 2010 he officially became the second male Acro-Cat. When it comes to the Acro-Cats, I guess there's lots of girl-power! 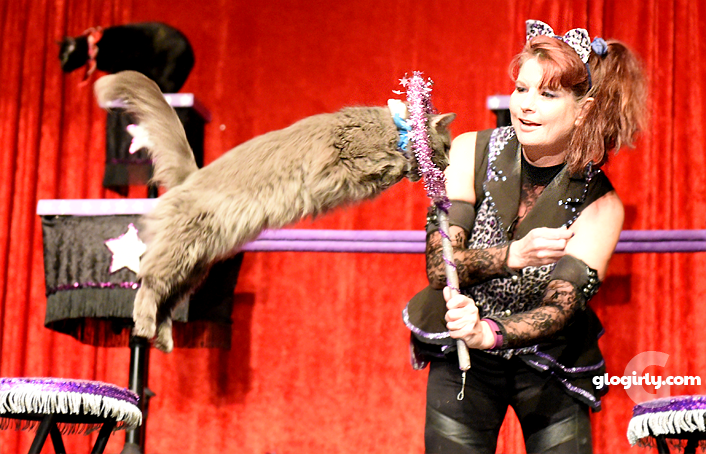 I was so impressed by ALL of the Acro-Cats and how they focussed on and followed their human assistants' cues. Sure, there are plenty of *I'm a cat and I'll do as I please* moments...that's part of the fun. But to see their connection, their eye contact and how they are all just having fun being cats made my heart smile big. That's Nola and Oz going for a ride as they follow Samantha's cues. Looks like Oz is a real backseat driver. 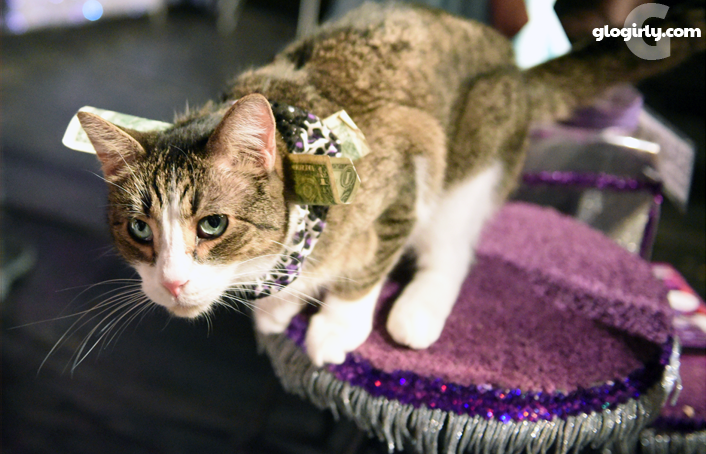 In addition to the amazing cats, there are a few *surprise* performers. 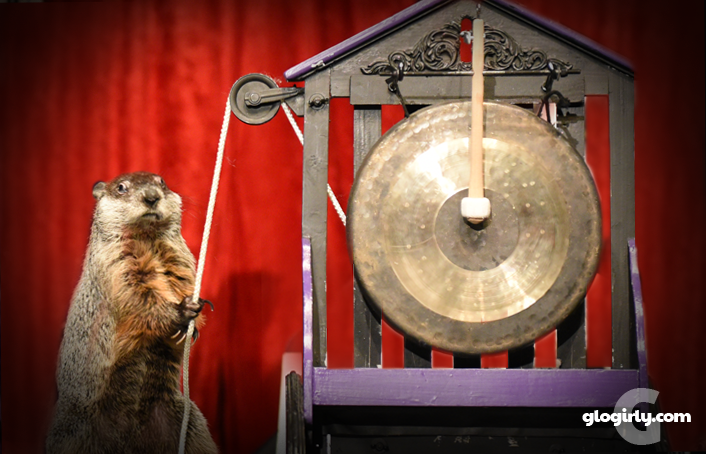 Garfield the groundhog specializes in ringing his gong and raising the American flag. He was SO into his gong, I thought I'd die laughing. 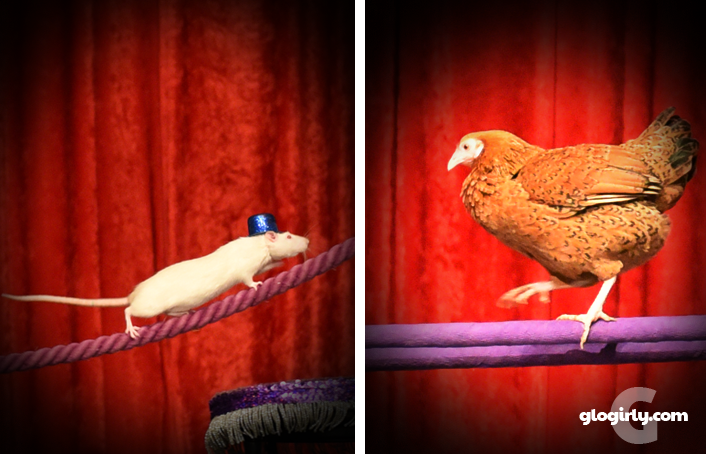 The Rats in Hats (there are 3!) dash across the high rope while Cluck Norris the chicken hops along the parallel bars. He also plays the tambourine in the band. 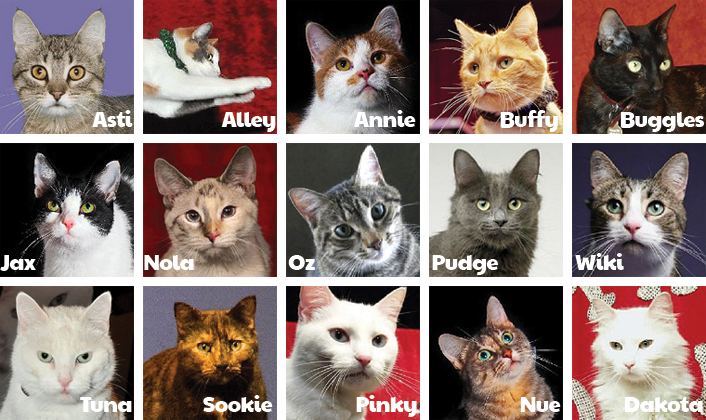 Each of the cats has their own page on the Acro-Cats website. Their bios are SO much fun to read and include things like their signature trick, how they became an Acro-Cat, their likes and dislikes and a special 'little known fact' unique to them. Meet the Rock Cats HERE. Just when we thought the evening couldn't get any better... the whole audience was invited up on stage to get up close and personal with the cats. Photos are encouraged so this gave me an even better opportunity to get some great close ups. 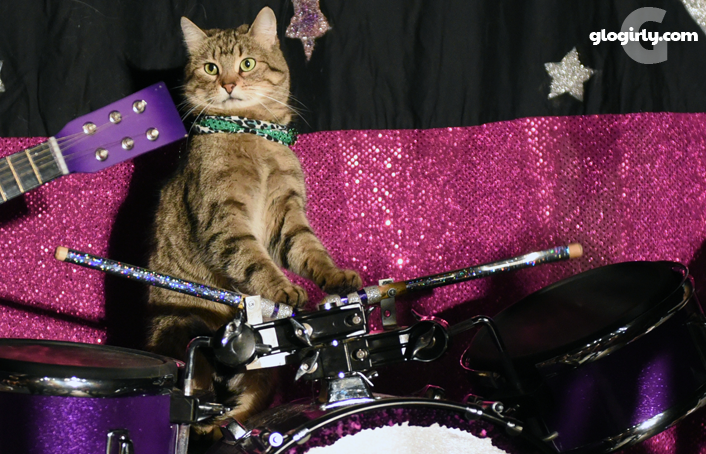 This is Nue on drums for the Rock Cats. Even with all the people on stage, she was SO focussed on her assistant's cues as she tapped away on her drumsticks. This all demonstrated to me just how genuine their mission is and how important the audience is to them. 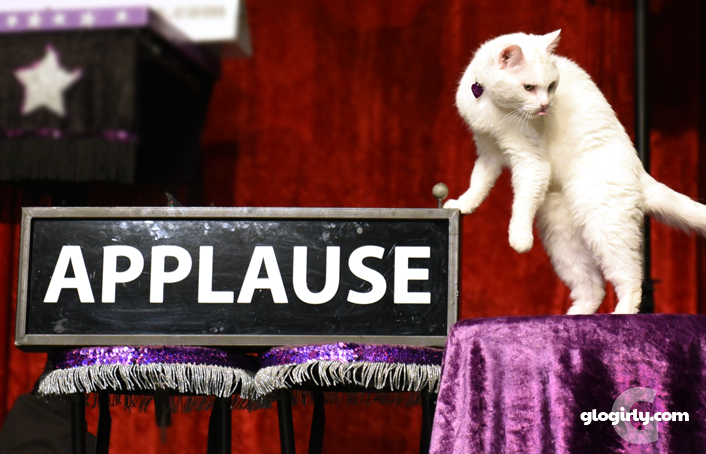 It was a full house and it sure looked like every single person stuck around to get up on stage and meet the cats. 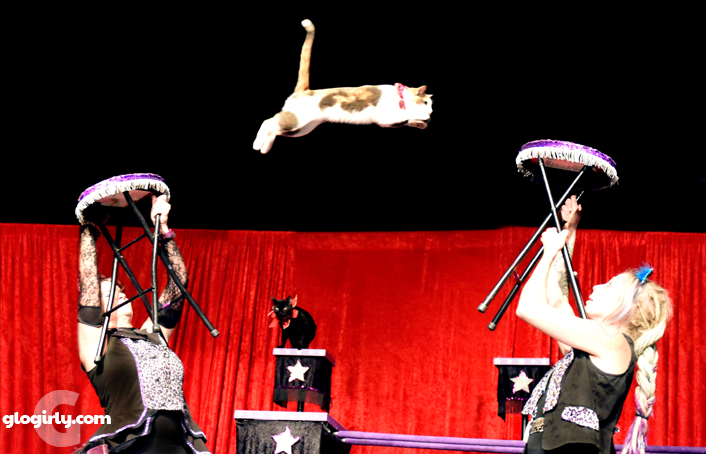 This was the first time I'd seen the Amazing Acro-Cats, but it certainly won't be the last. I'm a fan for life. The next stop on their tour will be in their hometown of Chicago, October 6 thru 9. You can check out their tour schedule to see when they'll be in a city near you!